I wanted to know what you thought about this. Also, I want to know what you think about Soy. I have heard some stuff about it and I want to know if you think it's good or bad. Also, is being a vegan really healthy? And are organic eggs from chickens that are cage free and range free and organic milk from range-free cows really good? Sorry for all the questions but I really need help. Thanks so much! You have lots of great questions! I am familiar with Fit for Life and think it has its benefits. There are many ways to attain optimal health. 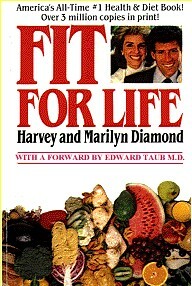 If the principles in Fit for Life are appealing to you, there is no harm in following it. Regarding soy: if you have a family history of breast cancer, I'd stay away from it. If you choose to use soy products, I'd suggest purchasing organic forms. A vegan diet is a very healthy diet when properly planned. Also, all the pages in my Healthy Eating section in the green box titled, Eat Food, Not Chemicals, should speak to many of your concerns.